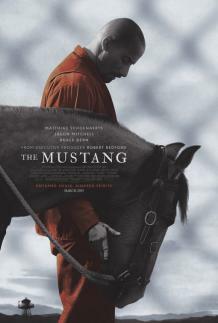 “The Mustang, set in a remote prison compound nestled in the Nevada desert, is a lyrical movie. It’s about the bond between a hardened prisoner and a wild horse, and it’s been made, by the first-time director Laure de Clermont-Tonnerre, in a style of great-plains minimalism. “Matthias Schoenaerts plays a man named Roman Coleman, with a shaved head and a biker goatee and a stoic glare, who’s behind bars. “An opening title informs us that there are 100,000 wild mustangs still roaming the U.S., but that their numbers are dwindling as land becomes privatized and the animals are captured and even euthanized. The Mustang is about the wild horses that are caught and sold for auction after being put through a program in which they’re trained by prisoners.